Friends are the family we choose for ourselves. 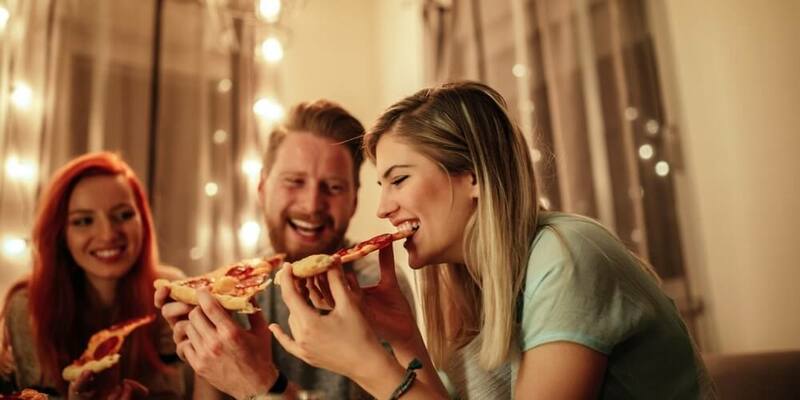 Whether you’re hosting a Thanksgiving celebration for college friends who can’t make it home for the weekend or you simply want to spread joy to your work friends, hosting a “Friendsgiving” is the perfect excuse to eat in excess and have fun with friends. And to make this year’s get-together even better than last year’s, follow these Friendsgiving ideas for an unforgettable festive day of fun. Remember all those selfies and pictures with friends that are taking up so much storage space on your phone, nows the time to put them to good use. Print them, use clothesline pins to hang them on a string, and secure the string to your wall using multiple adhesive, removable hooks. There’s nothing worse than going to a Thanksgiving party where you have to get all dressed up and use someone’s fine China. Keep is causal by buying disposable silverware, plates, and cups. That makes clean up easy and your life painless. Developing a Friendsgiving menu doesn’t have to be stressful. Let everyone know what you’re making (whether it’s turkey, ham, or something totally untraditional) vs. what they need to bring if they want their favorite side – the Bring Your Own Food (BYOF) rule. Make sure the dessert table is on your list! We take dessert very seriously during Friendsgiving. It’s the cherry on the cake 😛 for your festive dinner. Again, this can be something “assigned” out to one of your friends to bring, but make sure there are options. Remember, just because you’re hosting Friendsgiving at your place (or your parent’s house,) doesn’t mean you need to break the bank. 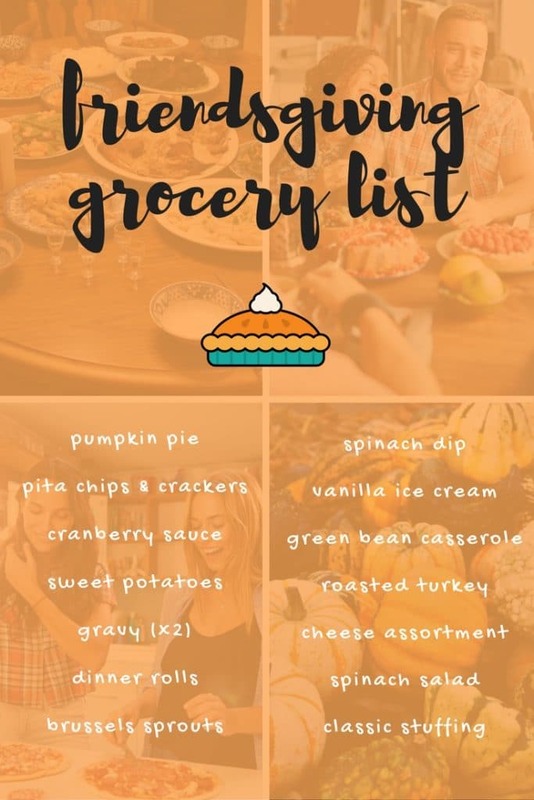 Use this grocery list to make sure the basics are covered on your Friendsgiving menu. Football is a Thanksgiving tradition for many families. But if your squad isn’t into tossing the pigskin, you can start a Friendsgiving tradition of your own. Try a frisbee game like KanJam, or get teams together for kickball. Any of these will allow your competitive friends to earn bragging rights, and burn just enough energy for you all to head back inside for more dessert! Remind everyone what you all came to celebrate. Take time as you eat to go around the table and have everyone say why they’re thankful this year. As your guests leave at the end of a fun day of Friendsgiving, let each one know how special they are to you. Has she kept you from being homesick? Did he stop you from dropping a tough class he knew you could handle? Did she help you get the internship of your dreams? Show your gratitude to each of them, and let them know you appreciate them today and every day. DormTopper is thankful for you! At DormTopper, we give thanks to customers who have made our product the best college mattress topper for students. We hope you have a weekend full of good food and fun, make great new memories and enjoy lots of extra sleep! Happy Thanksgiving! See why DormTopper is the best mattress topper for college students.